Betties N Brimstone: Week 16: It's a Boy! I want to try to make an effort to NOT overwhelm you with baby stuff, since this isn't a "mommy blog" per se, but it is a major part of my life right now, so you will get bits and pieces here and there. Fair warning, this is one of those posts. We bought our crib! We ended up purchasing this crib online from Target. We looked at a lot of places, and most of what we saw was a) not black, b) ridiculously expensive, and/or c) huge and bulky, not our style! I wanted simple, modern, without a lot of curves. This was even before we knew the gender of the baby. 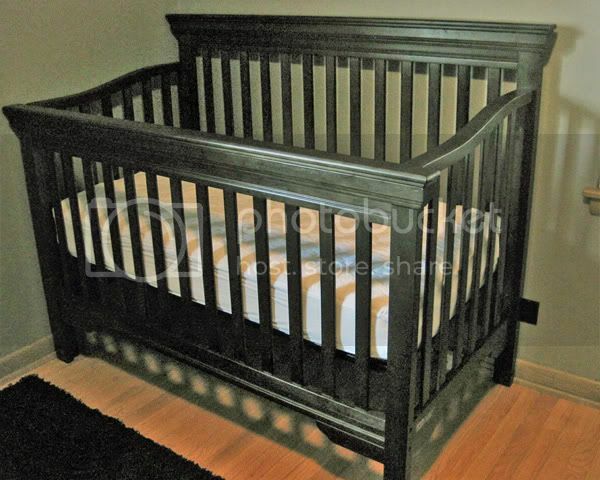 Oh yeah, this is the actual photo of the crib in the room. I apologize because the photo was dark, and I over-processed it on Photoshop in my efforts to try to make it brighter. Sorry bout that. But oh yeah... it's a BOY! Last week, we went to an ultrasound in Oak Park, called "First Peek," where you can see your baby in a 3-D ultrasound and they'll determine the gender starting at 15 weeks! Some friends of ours had used the service, so the business came very highly recommended. We had a wonderful time, we saw the baby in 3-D (I saw him move his teeny arms!) and the technician told us it was a boy! Little baby wiener! Another really fun service that this place provides is to record your baby's heartbeat and put it into a tiny teddy bear or other stuffed animal. When you squeeze the animal's belly, you can hear the recorded heartbeat! I chose this tiny leopard guy. So, that's the latest in baby world. In my next post I'll share a couple new non-baby-related items I picked up while shopping! oh i am sooooooooooo excited for you, yaaay! i cant wait to hear more. 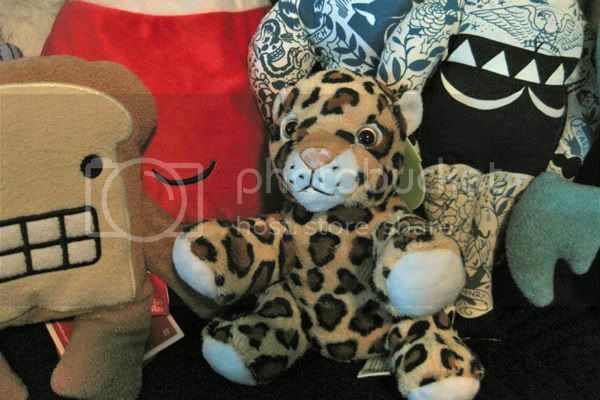 your little boy will be soo cute.. xxooxoxo... i love the crib, and that leopard! soo cute. i need to send you a mini metal t shirt for him hehe. you must email me your address before he is born! Yay for little boys!!! I had no idea you were pregnant (I was away when you posted it!) CONGRATS! !